Rob has been playing the drums for the past 40+ years and has been teaching the drums for the past 20+ years! He is an award winning drummer and educator and has toured, recorded and performed all across the country. After starting a family, Rob decided to make teaching his priority. He still performs locally for supplemental income but teaching is his passion and allows him to focus on his number one priority… his family! In addition to his awards, Rob has been blessed to work with several major drum companies as an Educational Endorser. Many of his students have gone on to the Orange County High School of the Arts, Musicians Institute and the Berklee College of Music. Rob's parents were amazing, but they did not encourage his love of drumming. Consequently, Rob had to do everything on his own to follow his passion. When he was 16 and had his first real part-time job, he used his own money to purchase drum lessons. 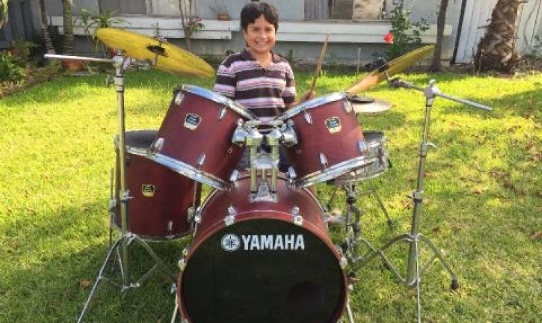 He did not have a drum set at the time but devised a way practice that he uses with his current students who don't own drum sets. Unfortunately for Rob, his first two teachers were a huge disappointment. The first teacher was embittered and negative. The second was nice but unorganized. It wasn't until several years later that Rob connected with his first really good teacher. Rob uses his negative experiences with teachers as well as his positive to shape his teaching personality. He is more coach/mentor than dogmatic dictator. The goal of this curriculum is to accommodate each student’s potential and cater to each student’s individual needs, wants and learning style. Each student has a preferred learning style (auditory, visual, tactile.) Rob strives to find which style works best for each of his students then molds his curriculum to best fit each student's learning style. Rob has students ranging from very young to senior citizens and also teaches students with a wide range of disabilities and special needs. There are no definitive black and white lines as to where the curriculum phases start and stop. Rather, each of the phases can overlap and intertwine as the student continues the learning process. The end result is to keep the student interested, challenged, rewarded and most importantly, playing the music they want to play as quickly as possible! The tools learned from this curriculum are designed to stay with the students indefinitely and create a solid foundation with which to achieve their musical goals. In short, the curriculum is designed to flex with each student's learning potential rather than to be rigidly administered in a dogmatic fashion. Phase 1: The first phase emphasizes proper grip and technique in order to assure that the student plays correctly and reduces the chance of acquiring a repetitive motion injury. Good technique is stressed throughout the entire span of lessons and the foundations are laid forth during the first month or so. The 40 International Drum Rudiments are used to teach proper technique including grip, fulcrum, stick columns, rebound control, wrist strokes, finger strokes, accents utilizing the Moeller technique and relaxation. Proper practice techniques are also covered. Beat studies are implemented in order to expose students to tempo, time and meter. Reading fundamentals are covered as well as basic music theory pertaining to rhythm. It is important to note that no two students are alike and that the amount of time devoted to practicing as well as the student’s individual skill level plays a pivotal role in determining the progress of the student. Phase 2: The second phase emphasizes the building of a vocabulary utilizing the rudiments and sticking patterns covered previously. The concepts of “One Surface Learning” as well as Coordinated Independence are introduced. Coordinated Independence is one of the most challenging aspects to playing the drums and much time is spent breaking the techniques down. Creativity is encouraged and the students will learn how to multiply the patterns they’ve learned exponentially! 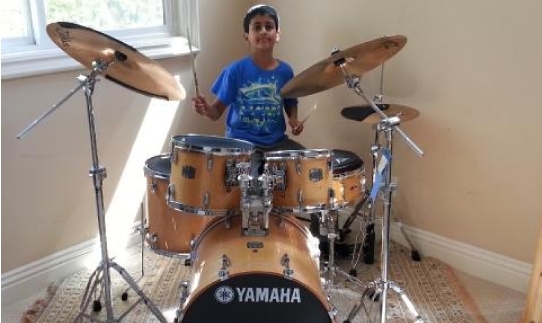 The student will also be introduced to different styles of drumming and how they are inter-related. Phase 3: The third phase includes having the students choose songs they want to learn. They will learn the fundamentals of writing and reading a chart for the song and playing along with it. State of the art software is used to provide professional, easy to read transcriptions as well as playalong practice CDs with slowed down versions of the students' chosen songs (making it easier and more enjoyable to build up to the required tempo.) Advanced styles will be introduced as well as specific techniques pertaining to the genres the student wishes to concentrate on. Customized Lessons: No two students learn alike. Some of my students are visual learners. Some of my students are aural learners. Some of my students are tactile learners. I also have many special needs students who have various disabilities. I strive to find the learning styles preferred by my students then capitalize on them while also exposing them to other learning styles in order to help them grow. As a result, each student's lessons are customized and tailored to get the most results while ensuring the lessons remain fun and stress free!